The Astro Blast Helmet is a compact lightweight blast helmet with a large flat lens which provides excellent vision without distortion. The Astro Blasting Helmet is your number one economy choice which meets standards worldwide including CE, Australian Standards and is approved by NIOSH. Lightweight means less fatigue, the Astro Blasting Helmet only weighs 1.2Kg. Each part on the Astro Blasting Helmet can be easily replaced using conventional tools, reducing downtime if you need to replace parts it can be done on the field. The Airblast Climate Control Tube for cold air cools compressed breathing air coming into respirators by as much as 18 °C). The Airblast Climate Control Tube for hot air warms compressed breathing air coming into respirators by as much as 17 °C). Both tubes helps maximize worker comfort and increase productivity in cold or hot climates. Model 88E39 Blast Helmets provide advanced protection in the harsh exposures of blasting andpainting. The snug, yet comfortable, sewn-in neck cuff provides a physical barrier to airborne contaminants and helps maintain positive pressure within the helmet. A new double lining in the neck area now enhances durability and protection. Lightweight pillow foam padding provides maximum comfort and reduces outside noise to a minimum. A soft breathable inner cape allows perfect airflow while keeping out contaminants. The advanced Air Duct Distribution System creates a constant flow of breathable air, prevents fogging and keeps workers cool. The large, double lens offers optimum vision without irritating side glare. Every feature of the NOVA has been designed, manufactured and tested to ensure workers’ safety and comfort under even the most demanding conditions. The Tear off Lenses system is a unique “FIT AND SAVE” system of pre-folded tabs. This means workers can quickly tear off just one, layered, lens at a time. Contractors have reported a time saving of over 45 minutes a day per blaster using the “FIT AND SAVE” system, and a resulting increase in productivity. 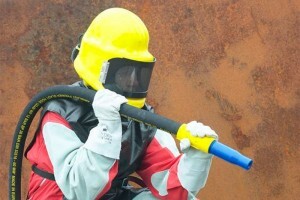 Blast helmet made of a lightweight glass fibre reenforced polyester with a yellow rubber coating limits the sounds of rebounding blast particles to a minimum. Provides the user with a high protection by a comfortable overpressure. 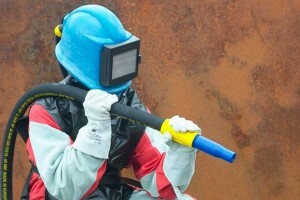 The yellow airflow indicator shows whether sufficient air is being passedinto the shot blasting helmet. The wire mesh screen and the disposable visor protect the main visor and can be easily exchanged. An exchangeablecotton neck seal ensures comfort and a high protection factor. A cape orjacket, available in leather, bisonyl or cotton, protects the user’s chest, back, and shoulders. 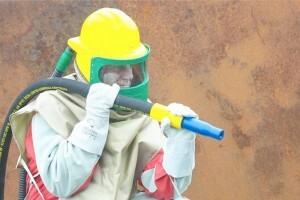 Blast helmet made of a lightweight glass fibre reenforced polyester with a blue rubber coating limits the sounds of rebounding blast particles to a minimum. Provides the user with a high protection by a comfortable overpressure. The yellow airflow indicator shows whether sufficient air is being passedinto the shot blasting helmet. The wire mesh screen and the disposable visor protect the main visor and can be easily exchanged. An exchangeablecotton neck seal ensures comfort and a high protection factor. A cape orjacket, available in leather, bisonyl or cotton, protects the user’s chest, back, and shoulders. As you know, compressed breathing air can create a deadly environment. 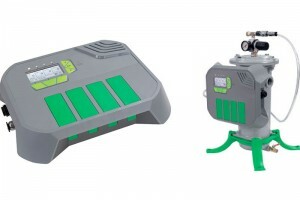 Do you have an intelligent gas monitor which can give you complete confidence in the air you and your employees are breathing? The GX4 is your solution. With the ability to detect up to 4 gases and with traceability the GX4 gives you a perfect solution. Gases like Carbon Monoxide are invisible to all the human senses, yet are commonly found in industrial premises’ worldwide. While low level carbon monoxide exposure may not be immediately fatal to employee’s, ongoing contact with the gas at low levels has a cumulative effect, causing serious illness and health concerns for employee’s long term. With symptoms often confused with the flu, headaches or tiredness, it’s a serious problem which is often too easily ignored. 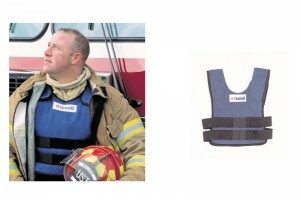 Airblast’s revolutionary Cool Vest technology offers unparalleled cooling power. Unlike ice or gel packs that steadily lose their effectiveness. Airblast Cool Vests will remain at a CONSTANT 13° C / 55° F. for hours of cooling. The Cool Vest can help reduce the chance of heat-related illnesses that sometimes occur in today’s difficult work environments. Airblast Cool Vest: lightweight, quickly recharged, no condensation, and constant temperature. 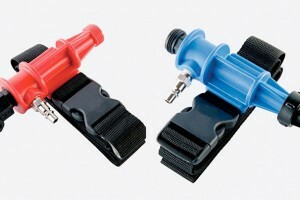 Uses a simple, interchangeable, front/back cool pack system that provides continuous cooling to the worker’s upper body. The vests are easily adjustable for maximum comfort and flexibility. 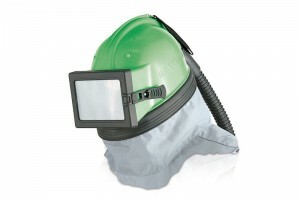 Airblast Helmet Air Filter (HAF) is designed to remove oil mist, water vapour and particulates down to 0.5 micron from breathing grade compressed air. 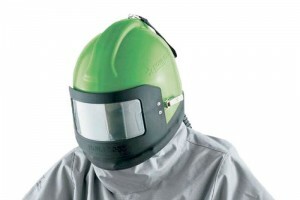 The Airblast Helmet Air Filter meets OSHA regulation 1910.94 (6) (ii), requiring a trap and carbon filter be installed and regularly maintained to remove objectionable odours, as well as water, oil mist and other particulates. 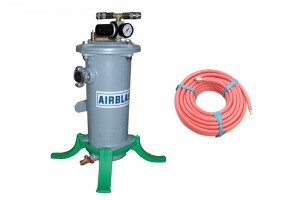 The Airblast HAF is supplied incl. pressure reducing valve to reduce the pressure to the requirements of supplied air respirators, providing that the inlet pressure does not exceed 8,6 bar (125 PSI).